Capital of the department of Basses-Alpes, France. There was a Jewish community here as early as the thirteenth century. Salve, a Jew of Digne, with Rotelus of Olobrega (Israel of Valabrègue) and Bonfils of Beaucaire, was one of the commissioners appointed to apportion the tax which, in 1299, the Jews had promised to the Count of Provence, to whom Digne belonged. In 1305 Baruch of Digne, an eminent rabbi, had a heated controversy with his former teacher, Isaac Cohen of Manosque, and was excommunicated by him. Baruch, refusing to submit to this punishment, went to France. 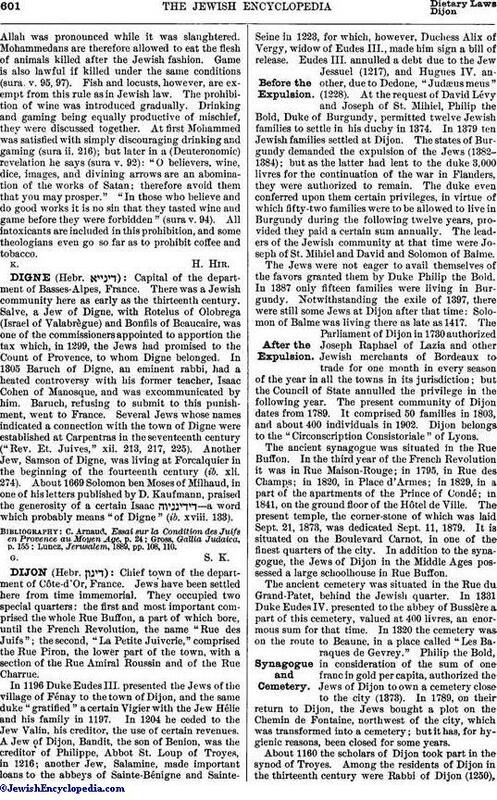 Several Jews whose names indicated a connection with the town of Digne were established at Carpentras in the seventeenth century ("Rev. Et. Juives," xii. 213, 217, 225). Another Jew, Samson of Digne, was living at Forcalquier in the beginning of the fourteenth century (ib. xli. 274). About 1669 Solomon ben Moses of Milhaud, in one of his letters published by D. Kaufmann, praised the generosity of a certain Isaac —a word which probably means "of Digne" (ib. xviii. 133). Luncz, Jerusalem, 1889, pp. 108, 110.